The Texas A&M Aggies survived a late-game comeback to give the Tennessee Volunteers their first loss on the season. The No. 9 Tennessee Volunteers comeback efforts fell short as the No. 8 Texas A&M Aggies won in double overtime 45-38. The Vols looked as if they had fixed their first-half jitters, tied with the Aggies at seven with more than three minutes remaining in the first quarter. However, the Aggies took advantage of two fumbles by the Vols and extended their lead to 21-7 by the end of the quarter. If there is one thing that Tennessee has proven, it’s that it plays its best football from behind. Coming out of halftime, the Volunteers drove down the field and fumbled the ball once again. Texas A&M then converted the turnover into points, scoring a touchdown to extend their lead to 28-7 — tied for the largest deficit the Vols have faced all season. Tennessee responded with a 15-yard touchdown run by senior running back Alvin Kamara to cut the lead to 28-14 going into the fourth quarter. 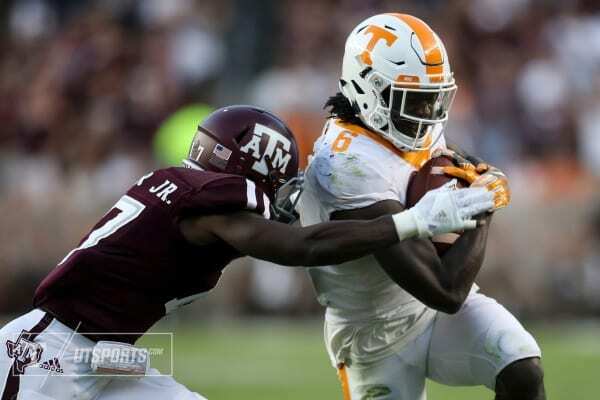 The Vols scored early in the fourth quarter on a run by sophomore running back John Kelly to cut the lead to just a touchdown, but Texas A&M responded minutes later with a 62-yard touchdown run from quarterback Trevor Knight. Just the next drive, the Vols scored on a six play, 65 yard drive to cut the deficit to 35-28 with just more than two minutes left on the clock. The Aggies were up seven with two minutes left to go when Knight connected with Trayveon Williams for a 71 yard pass. However, a spectacular play was made by cornerback Malik Foreman as he forced a fumble into the back of the end zone, resulting in a touchback. Tennessee then marched up the field on an 80 yard drive, capped by a touchdown pass to Kamara, to tie the score 35-35 with 41 seconds remaining. The Aggies responded with a late-game drive to set up a 38-yard game-winning field goal. But the kick missed wide left, sending the game into overtime. The Tennessee Volunteers entered overtime with the momentum, but were forced to settle for a field goal on the first possession of overtime. The Vols’ defense then managed to hold Knight and the Aggies to a field goal, sending the game into double overtime. On the first possession of the second overtime period, the Aggies reached the end zone in three plays on a one-yard touchdown run from Knight. The Volunteers were unable to strike back, as quarterback Joshua Dobbs threw an interception on the first play, resulting in a 45-38 victory for the Aggies. Although Tennessee led in total yards, with 288 of them belonging to Alvin Kamara, the biggest difference came from the Vols’ seven turnovers and 84 yards in penalties. This loss puts Tennessee at 5-1 on the year, 2-1 in conference play. The Vols host top-ranked rival Alabama next Saturday at 3:30 ET at Neyland Stadium.